At some point, everyone discovers Gould. Many are led to him, as I was, by Bach. Listening to his 1955 recording of the Goldberg Variations, something strange happens. It’s as though a mathematician has posed an unfathomable problem and here’s someone solving it without, it appears, having to think. It’s hard to believe (for a while at least) that a human is playing the notes. Some sort of machine, surely? But then come the viewings, Gould bent over the piano, sometimes only a few inches from the keys, low enough to pull them down (as he’d been taught by Alberto Guerrero) instead of striking them, intensely focussed, singing the melody, as if there was a physical bond between piano and man. 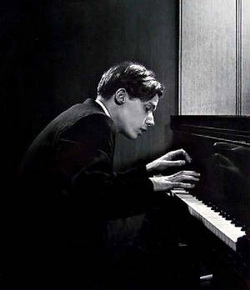 For the uninitiated, Glenn Gould was a Canadian pianist, born in 1932, who impressed from the beginning. As with Rose Grainger, Gould’s mother always intended him to be a great musician, and this extended to playing music to him in the womb. He hadn’t been out long before he showed signs of genius. He had perfect pitch, could read music before words and was accepted into the Royal Conservatory of Music in Toronto at age ten. Two years later he passed his final exam, graduating with the highest grade of any candidate. I could explain what comes next, but it’s a matter of record: playing with the Toronto Symphony at 14 (the first movement of Beethoven’s ‘Fourth Piano Concerto’), his first solo recital at 15. But, given this, he wasn’t your typical child prodigy (if there is such a thing). He once said the piano is ‘not an instrument for which I have any great love as such …’ Although this box of hammers and strings earned him a reputation as one of the great twentieth century pianists, he once told biographer Otto Friedrich that if he hadn’t been a pianist he would’ve been a writer. Any journey into the life of Gould soon exposes the contradictions. As with Grainger, meticulously recording his own eccentricities, Gould had a love-hate relationship with the maple box. Although it was the path to wealth and fame it couldn’t hope to contain his interests and ambitions. And it’s these that interest me. But Gould was never boring. Although he had the technical perfection to match Kissin, he also had a sort of … strangeness. An intellect like his could never be contained, or indeed, simply described. The chances are, if he’d lived beyond 50, he would have returned to his early passion for composition. He left very little, and mostly unfinished, work. His ‘String Quartet, Opus 1’ (composed in his early twenties) shows what might have been. It contains traces of Beethoven and Schoenberg, but its vision is clear and remarkable, from its simple, ethereal opening, to its playful fugues (yes, Bach is there too). Gould stopped giving concerts early in his career. Later, he was offered a blank cheque to change his mind but he thought live performance was a ‘force of evil’. With typical eccentricity, he explained his ideas in the ‘Gould Plan for the Abolition of Applause and Demonstrations of All Kinds’. He believed that concert audiences (as much an anachronism as the clothes they wore) turned music into an undignified competition. Certainly not what JS would’ve wanted. Thankfully, for us, he concentrated on recording. Here, the composer was King. He could study the score, select takes, edit, and bring new perspectives to works that had often been over-recorded. For me, this can best be heard in his three radio documentaries. These works allowed his mind to drift away from Bach and Scriabin into less well-mapped territories, both physical and emotional. They matched a world-view that contained Alban Berg and Petula Clark, Scarlatti and jazz. Perhaps it was his belief that music had peaked in the Baroque (‘the piano is a contrapuntal instrument’) and now had less to offer. 1967’s The Idea of North was Gould’s attempt to describe isolation. Although this radio work was about journeys into the Canadian wilderness, it was really a riff on his own aloneness. The hour-long documentary begins with voices, entering separately, fugues made not from little black dots but unidentified people talking about their lives. The constant click-clack of train wheels (he called this an ‘ostinato’) reminds us of our own journeys, real and spiritual. At first, the listener is swamped, but then things settle, and the voices start making sense. A little like a Bach-saturated Gould emerging from his mother’s womb. He was an outsider. His ‘eccentricity’ needs to be seen in the context of a culture that worships the bankable; the tried-and-true; musicians-as-athletes. Normal, to him, was that ‘incredible tapestry of tundra and taiga which constitutes the Arctic and sub-Arctic of our country.’ He had become, in a sense, more creator than re-creator. As with Grainger, he believed the former had the greater claim on posterity. The sensible becomes insensible. Did it really matter that he sang as he played? That he preferred the night, waiting until after sunset to do his shopping? That he always wore coats and gloves? That he hated being touched? There was always a reason. The old wooden chair he played on had been made for him by his father after a childhood accident left him with spinal damage. Of course, it wasn’t about the chair, it was about his father, and the love that had gone into making it. Therein lies the mystery of Gould: the need (but impossibility) of love. Relationships were never easy. In 1967, in the midst of North, he became a family man, of sorts. Cornelia Foss, the wife of American composer Lucas Foss, moved to Toronto with her two children to start a new life with him. They lived together for nearly five years before she returned to Lucas. Gould didn’t take it well. Foss noted that within weeks his mental state had declined. She said, ‘My life became more restricted as his paranoia become more evident. He became more difficult and I think this was due to the fact that he was taking more anti-depressants … his personality began to change rapidly.’ In the end, she wasn’t willing to risk her children’s well-being. Gould returned to his life-within-a-life. Perhaps, in the end, it was easier to analyse the nature of his, and other’s isolation, than to wait for love. Soon, he made another radio-phonic experiment titled The Latecomers. It concerned life in isolated districts beyond Newfoundland. Then, in 1977, The Quiet in the Land, an examination of a Mennonite community near Red River, Winnipeg. Together, The Solitude Trilogy is about those who choose to withdraw from the world. In a way, the same thing he had done when he first sat a piano. Perhaps this was Gould’s greatest fear: that there was little he could do to stop being Gould. Self-examination didn’t work. His obsession with recording his blood pressure, medications and health problems was another take on his own isolation. On 27 September 1982 Gould complained of a headache. It was really a stroke. He descended into a coma and a few days later his father, Bert, decided his son’s life support should be switched off. As Gould himself would’ve wanted it; as he headed north, for the last time. Gould once said: ‘If an artist wants to use his mind for creative work, cutting oneself off from society is a necessary thing.’ As we listen to any of his sixty major recordings, we can hear this focus.